Room share, B & B (bed and breakfast), etc. Official Web Site Address TEL, Photo, etc. * 6 min. walk from Kanayama Station North exit. Meijo Subway Line exit 1. Hostle WASABI 13-5, Tsubaki-cho, Nakamura-ku, Nagoya C.
* 5-min. walk from Nagoya Station. Get off at Shiyakusho Station on the subway Meijo Line. 20-min. walk from Nagoya Sta. Click "¥300", then you will find a cupon there. If you are a claustrophobic, it's difficult to stay there. 5-min. walk from Fushimi Sta. Exit 10.
on the Higashiyama or Tsurumai Subway Line. K's House Hakuba Alps . 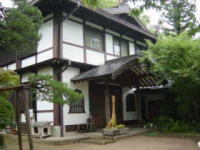 3-min walk from Kintetsu Omiya Sta.